The first big upset of the Conference tournament occurred when the 2-seed American Athletic Conference fell to the 7-seed Colonial Athletic All-Stars. the actual www.valueaddbasketball.com calculations indicate the AAC would win the match-up by an average of eight points - however William & Mary Nathan Knight scored 24 points and helped the CAA dominate the boards for a 90-82 upset the CAA led the whole way. The CAA will now play the 3-seed Southern Conference, which snuck out a 67-60 win over the A-Sun. The other two teams allowed in the Southern Region are the 1-seed SEC and 5-seed Big South. More important for the game, the game played in 41 minutes, making it fast enough for many board players. 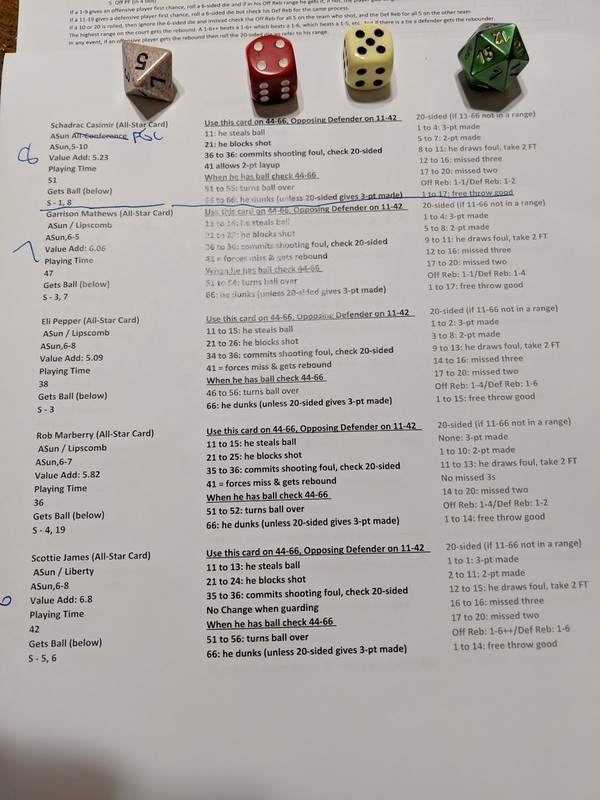 * After beta testing several games, we adjusted the game to start with a 20-20 tie with 7:54 left in the first half - then went back and retroactively adjusted what the scores should have been with this change (it did not change any winners, but could in the past, as the favorite calculated to win by 50% more than the realistic score in a full 66-possession game, however, staring at 20-20 after 21 possessions, each team's chance of winning is equal to what it should be in a real game. For example, The Big East would have likely lost to the ACC but by a 81-65 final in the dice game (the Big East All-Stars would actually average losing by to the ACC by about 8 points, but the dice favored the ACC in the actual matchup). Big East stars Shamorie Ponds and Markus Howard combined to hit three 3-pointers on three straight trips to cut the ACC lead to 26-25 with 7:54 left in the half. From that point it was all ACC as they surged to a 81-65 win. Ponds scored 22, but RJ Barrett (Duke) blocked 2 early shots from All-American Markus Howard (Marquette) and Hunter (UVa) and Zion Williamson (Duke) also played lock down defense in the www.valueaddbasketball.com dice game. To play your own game, click on the first 2 links for instructions and scoresheets, then pick two teams from any of the links below for player cards. You need only two 6-sided dice, a 20-sided die and an 8-sided die. After the ACC, SEC and Big East advanced to the Conference "Sweet 16" the game between Murray State's Ja Morant of the Ohio Valley Conference (OVC) and Buffalo's CJ Massinburg of the Mid-American was a back-and-forth affair. The following is the bracket, followed by a photo and stats from the OVC vs. MAC game. 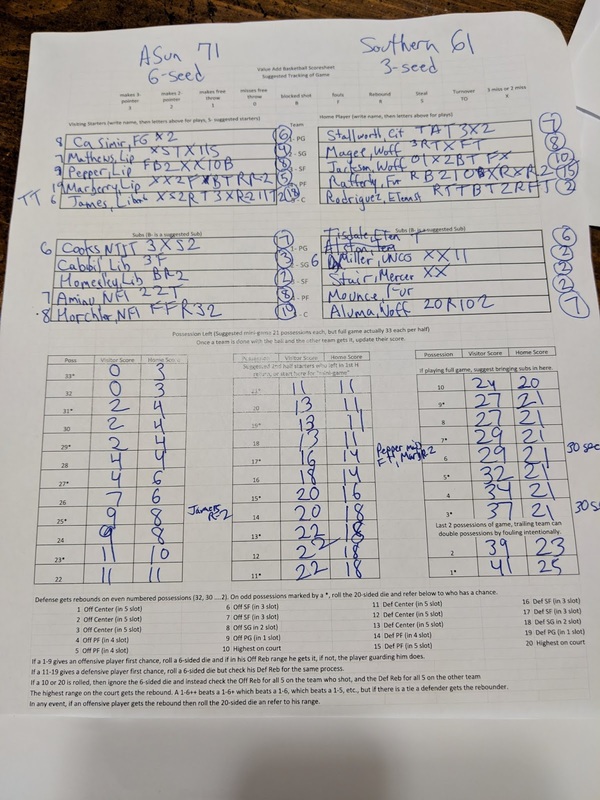 Here is photo of what the game looks like if you print the cards from the google doc, and then fill in the scoring sheet during the game. was the actual scoring in the OVC vs. Mid American game. The first 9 Value Add Basketball games matching up all-conference teams were "chalk" withwthe favored team. However, when Southern Conference stars Fletcher Magee (Wofford) and Matt Rafferty (Furman) took their rests, the ASun proved much deeper on the bench and surged to a 17-point lead on route to a 71-61 first upset of the tournament. The 10-member ASun team featured 3 players each from Lipscomb and Liberty - 2 schools that also stunned teams in the NCAA and NIT tournaments this year. Scottie James from Liberty had a game high 18 points, while North Florida's Wajid Aminu grabbed 5 offensive rebounds in the closing 10 possessions of the half. The following was the actual scoring of each All-Conference player from the sheet above. We only record and "R" for contested rebounds where the cards determine the battle for the rebound.We circle an "R" on the occasions where the best rebounder on the court at that time grabs the rebound from everyone else, but normally it is two players at the same position battling for the rebound. In this game Justin Turner fouled out trying to guard Morant as Morant tied the game at the free throw line 63-63 with just 14 possessions left for each team (a full game includes 33 possession for each team each half). However, CJ Massinburg went on a 6-0 personal run to make it 73-67 with 8 possessions left, and then James Thompson grabbed two rebounds away from everyone else on the court twice down the stretch to wrap up the game. SEC 83: Herro KY 16, Harper AU 13, Williams TN 11, Washington KY 8, Hall AL 3; backups Okeke AU 10, Gafford 10, Waters 6, Mays 4, Silva 2. Southland 71: Greenwood SELa 19, Maxwell AbC 16, Franklin AbC 10, Harris SFA 8, Delaney SH 1; backups Ricks 5, Garth 7, DuBose 6, Mitchell 1, Delaney 0. Big East 97: Howard MU 24, Powell SH 19, Govan Gtn 11, Ponds StJ 6, Hauser MU 2; backups Booth Vill 13, Jones Xav 7, Krampeli Cr 6, Figerous StJ 5, Pascall Vil 4. NEC 73: Saunders Wag 13, Flowers LIU 9, Baxton StF 9, Edge FD 8, Hoehn SH 5; backups Anosike 9, Jordan StF 7, LaRose SH 5, Backmon SF 4, Jenkins FD 4. ACC 90: Hunter UVA 15, Williamson Duke 13, Barrett Duke 12, Blackshear VT 12, Reed Clem 5; backups Thomas Clem 15, Alexander-Walker VaT 10, Johnson UNC 4, Guy UVa 3, Jerome UVa 1. Atlantic Ten 82: Santos-Silva VCU 17, Gudmundsson David. 16, Toppin Dayt 12, Bess StL 5, Dowton RI 5; backups Brown StJ 7, Cunningham Day 7, Evans VCU 5, Vann VCU 5, Osunniyi StB 3. American East 68: Duncan VT 12, Lamb VT 8, Sherburne UMBC 8, Yeboah SB 7, Lynch Hrt 7; backups Gantz UMass-Low 8, Lutele UMass 7, Blagojevic Hart 6, Healy Alb 3, Smith VT 1. Big-12 96: Wade (K-State) 24, Culver (Tex Tech) 15, Brown (K-State) 11, Lawson (Kansas) 10), Moretti (Tex Tech) 2; Back-ups: Owens (Tex Tech) 12, Haliburton (Iowa St) 9, Shayot (Iowa St) 5, Bane (TCU) 4, Dotson (Kansas) 4. Fouled Out: Lawson and Owens. SWAC 66: Blackson (PV A&M) 15, Combs (Tex South) 11, McKnight (Ark PB) 11, Doss (Ark PB) 6, McKinnis (Jack St) 1. Back-up: Daniels (Al State) 6, Smith (Grambling) 6, Andrus (Prarie View) 4, Patterson (PV) 4, Butler (Tex Southern) 2. Ivy League 79: Morgan (Cornell) 21, Cannady (Pr) 16, Aririguzoh (Pr) 16, Bruner (Ya) 4, Oni (Ya) 2; Back-ups: Choh (Br) 9, Barry (Dart) 6, Bassey (Har) 2, Tape (Col) 2, Brodeur (Penn) 1. Patriot League 67: Mahoney (BU) 16, Floyd (HC) 12, Nelson (Amer) 11, Ivanauskas (Colg) 8, Kostecka (Loyola) 4. Back-ups: Jaworski (Laf) 12, Cohen (Leh) 2, Andre (Leh) 2, Mackenzie (Buck) 0, Sestina (Buck) 0.